PROMOTE WELLNESS. PREVENT ILLNESS. PROVIDE CARE. 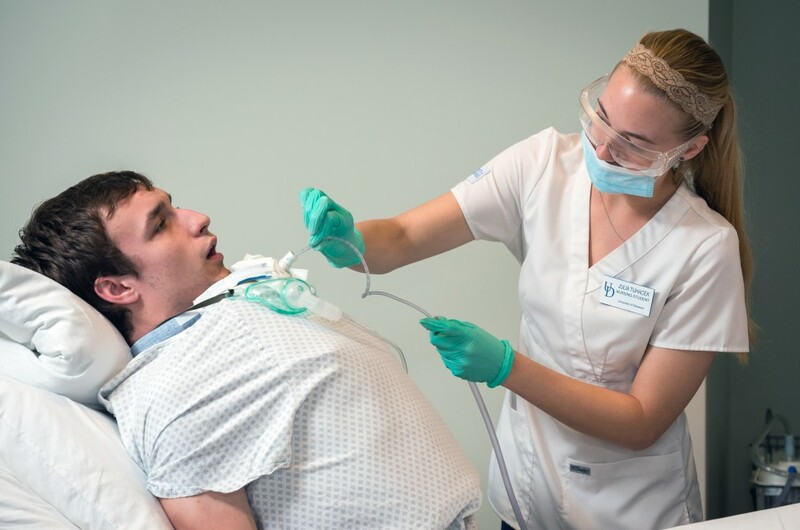 The University of Delaware School of Nursing offers several opportunities for students to become registered nurses through rigorous and flexible pathways that lead to a Bachelor’s and Master’s Degree in Nursing. All of our programs are rigorous and competitive. The UDSON also offers a pathway to for Registered Nurses to attain a bachelor’s in nursing through an on-line flexible RN-BSN program. The traditional undergraduate program is designed for pre-licensure students who desire a bachelor’s of science degree in Nursing. This is a four-year on-campus program and students are directly admitted to the Nursing program, beginning their Nursing curriculum as freshman. The accelerated degree program is a 17 month on-campus program designed for individuals who have a bachelor’s degree in another field and wish to pursue a bachelor of science degree in nursing. The RN to BSN program is an on-line program designed for registered nurses who want to attain a bachelor of science degree in nursing. Q: I am a matriculated freshman at UD and interested in changing my major to nursing, where do I start ? Q: Are students admitted directly to the school of nursing? A: The UD School of Nursing directly admits to the nursing program and nursing courses are taken in the freshmen year. In the first year, an introductory nursing course is offered in the fall semester and a basic nursing skills course is offered in the spring semester. Students are guaranteed a place in the nursing program and, provided students are in good standing, students progress throughout the program without reapplication. Students are also guaranteed placement in classes and in clinical rotations as they progress. A: Classes range from small group (18 students per instructor) to 150 for larger lecture settings. The average class has about 70 students. Q: Do Nursing students meet other UD students on campus? A: In the freshmen and sophomore years students are mixed with other students in the sciences and foundational courses. In the later years, nursing students meet other students in the free electives and breadth requirement courses. Students are also involved in fraternities/sororities, campus activities, in sports, and in their dormitory and apartment arrangements. Q: How about transportation to clinical? A: Students carpool, use mass transportation, or drive themselves to all clinical, field, and preceptor experiences. Some field and other experiences are within walking distance from campus. We encourage students to work together to save money and the environment. In addition, agencies prefer carpooling to decrease the stress on parking facilities. Q: Do I need a laptop computer? Q: Is academic help available? A: The student and faculty benefit from our Undergraduate Teaching Assistant Program. Also, the Beta Xi Chapter of Sigma Theta Tau, the nursing honors society, has a tutoring program. As part of its commitment to the students of the University of Delaware, the Office of Academic Enrichment has created a series of online study skills workshops to support you as you pursue your degree. Q: Do I have to live in the Living and Learning Community as a Freshman? Q: Can AP credits be applied to my UD Nursing Degree? A: Yes, they typically cover the free elective category. Other credits may apply for required courses, please visit our admissions page for rules. Q: What are breadth requirements? A: A college education requires some breadth of knowledge across diverse fields and perspectives. With this in mind, all students are required to complete a minimum of 12 credits from the list of University breadth courses. This includes 3 credits from each of the following categories: Creative Arts and Humanities, History and Cultural Change, Social and Behavioral Sciences & Mathematics, Natural Sciences and Technology. Students must earn a minimum grade of C- in each course to meet this requirement.